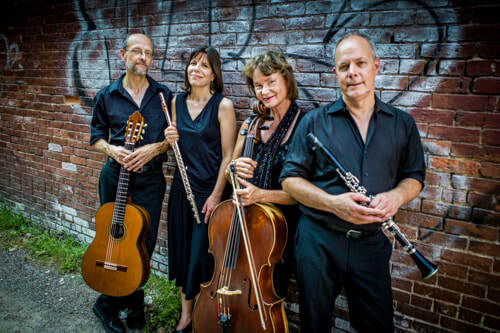 ​FREVO: a quartet performing an eclectic sampling of music for flute, clarinet, cello and guitar. Featuring musicians Steve Klimowski, clarinets; Bonnie Thurber Klimowski, cello; Wendy Greenwald Matthews, flute; and Peter Matthews, guitar; playing world music, jazz, classical, pop, and the newest sounds from today’s creative musicians, including their own original compositions. Seasoned musicians, their playing is virtuosic, yet lyrical and soulful. Two married couples, good friends who share their joy of the music with each other and engage the audience with their camaraderie, drawing them into the music. Their concerts include various groupings of the four -- solos, duos, trios, as well as the full quartet. Highlighted is the music of Corelli, Gismonti, The Beatles, and Mignone. From tango to ballad, sonata to Brazilian dance, their music appeals to audiences of all ages.